It’s also not surprising that there has been an emergence of more adrenaline-pumping activities. Adrenalin is great to fight boredom, and physical things are naturally great for getting adrenaline rushes. Some people I know hang out in gyms and similar popular “sweatshops”, not because they want to become more physically fit, but because they get bored too easily, although they convince themselves and their friends that it’s the idea of becoming fit that appeals to them. I’m sure that there is a mix of reasons, but “not getting bored” is one of them. FitnessTrainer.com; extreme sports; or loud music at a club are just variants of the same theme: ways to stop the boredom of being on your own and having to think on how to get some sort of entertainment. Now let’s get back to Second Life. When I first logged in, everything was new and shiny, and immediately appealing — I love to retell the story on how I spent 90 minutes just tweaking my avatar’s shape, before even taking a step into this brand new virtual space. And then spending 20 hours on my first day in SL. What did I do? Besides some exploring, what fascinated me most was watching people building amazing things on the sandboxes. For many, watching other people building might be incredibly boring. It is — but I wasn’t really passively watching: I was observing how fantastic this virtual world was, where one could create all those amazing things, and how all these talented, creative people were so engaged in doing their amazing work that they could spend hours and hours on it. Naturally enough, after a few days, and some struggles with the user interface, I did my own attempts (with zero success, but it was nevertheless fun all the way!) — and while doing so, I naturally engaged in conversation. I remember sitting on the ground with another newbie, and we both were figuring out what magic combination of keys would link two prims together (none of us had any previous experience of virtual worlds or of 3D modelling tools). Then we tried to understand how to get a chain of links set to physical so we could wear it as a necklace (it was impossible — it just became barely possible much later on, when Havok 4 was introduced — but we had no way to know that). All these were pretexts to engage in the virtual world with each other. When it became apparent that I had no talent to build anything (or create clothes! ), that didn’t mean that SL all of a sudden became boring. Not by far! Exploring it lead me to find new people, and those would point me to some communities, which in turn would build things together, arrange specific times to do some events, or just hang around at each other’s places and chat. The build-explore-communicate feedback loop worked all the time — even when communities split, some members would explore further, and find new people, and new things to do, and so forth. Also remember that in those days few people wrote about SL — we had New World Notes and the official forums, and little more. There was no in-world search (really!) — events were announced by LL every hour via a broadcast notice to all residents, and events were the meeting places where you exchanged ideas and met new people. There was really no “need” of a specially-arranged “first hour experience”. You were just dropped on a welcome area, and got greeted by the veterans. There was just one welcome area anyway, and it would be staffed by a Linden Liaison and groups of Mentors — I never saw any griefing there, although not many weeks afterwards I was told it was not uncommon (Linden Liaisons worked in shifts and were not all the time at the welcome area). It was quite frequent to have “your personal Linden” — one of the Liaisons would greet you, and for the first days, it would be the person to ask questions about SL and get some help. Of course, it was only months after that first experience that I knew what a “Linden” was. The whole point was that most people back then didn’t really need much “help” in the sense of aiding them with the immersive experience of SL. They figured it out on their own, and had fun doing it all the time. My own PowerBook Mac just got 3-6 FPS on a good day; 6 months afterwards, I found out about Preferences, and managed to tweak it to a whopping 9-12 FPS, which came to a shock to me! (Today, that very same PowerBook from 2003, which hasn’t died yet but has little use, can get 15-20 FPS out of Snowglobe — that’s how much SL has improved!) And understanding that you could actually turn the camera around also took me half a year. Nevertheless, in the mean time, before I figured all those things, I never stopped from having fun all the time! 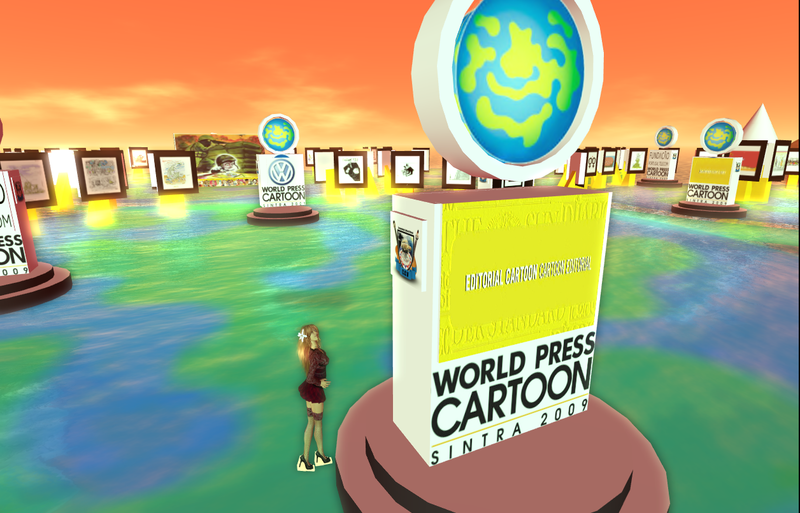 On my 2007 article, I focused more on the ability to create our own world — as opposed to having it “imposed” by some corporate designers upon us — as one of the secrets of Second Life’s success. I now think we don’t need to go that far. Most of the million active users are not talented, not even particularly creative or otherwise gifted. However, they all share the ability of being very good at entertaining themselves, and of figuring out ways to get some entertainment, or create it on their own. I remember to read on the old official forums that people complained all the time how there were never enough events of type X or Y. I, among others, usually asked back: “Why don’t you host them yourself?” They couldn’t really understand that. They expected entertainment to be provided for them, as part of SL’s service — not to work on SL’s behalf. Needless to say, a few actually did exactly that, and they’re still around; the others, failing to get others to entertain them, have long since left SL.